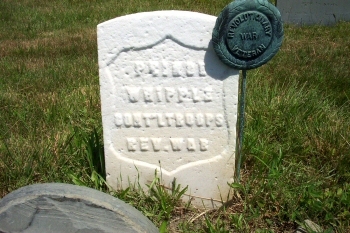 Prince Whipple fought at the battles of Saratoga and in Delaware during the War for Independence. He was also one of twenty enslaved men who petitioned the New Hampshire legislature for freedom in 1779. His owner, General William Whipple, was a signer of the Declaration of Independence and an aide to General George Washington. Although Whipple has been identified by some as the African American figure in the familiar painting of Washington crossing the Delaware River, it is doubtful he was present on Christmas Eve, 1776. Prince Whipple was brought from the coast of Africa to the colonial trading center of Portsmouth, New Hampshire in 1760 when he was ten. He grew into manhood enslaved, a body servant to one of the colony’s most influential leaders. Because of his expertise and refinement, Whipple also served as major-domo at the most elegant social events in the city. In 1779, Prince Whipple was one of 20 petitioners who identified themselves as African men who were taken from their native lands “while but children and incapable of self-defense” now making a plea to the New Hampshire legislature for manumission and for the abolition of slavery in the state. The petition was tabled without legislative action. While the author of the document is unknown, Whipple was literate, as were most of the other petitioners. Literacy was not unusual for New Hampshire slaves who had grown up within households of educated owners. For instance, Whipple’s wife, Dinah, who later ran a school for African children, had been raised in the household of a prominent local minister. Prince married Dinah on her 21st birthday, which also was the date of her manumission, February 22, 1781. Whipple, however, was not freed until 1784. When William Whipple died the following year, his widow honored the General’s promise to provide a lifetime home for his servants. She allowed Prince Whipple to move a house onto her property where he and Dinah raised their seven children. They shared this house with another former Whipple slave and his family. Prince Whipple died on November 21, 1796 at the age of 46 and is buried with his wife and at least one daughter and a granddaughter near the tomb of his former owner at North Cemetery in Portsmouth, New Hampshire. Charles W. Brewster, Rambles About Portsmouth (1859; reprint, Somersworth, NH: New Hampshire Publishing Company, 1971); Mark Sammons and Valerie Cunningham, Black Portsmouth: Three Centuries of African-American Heritage (Durham, NH: University of New Hampshire Press, 2004); http://www.seacoastnh.com/Black-History/Black-History/prince-whipple-and-american-painting/.